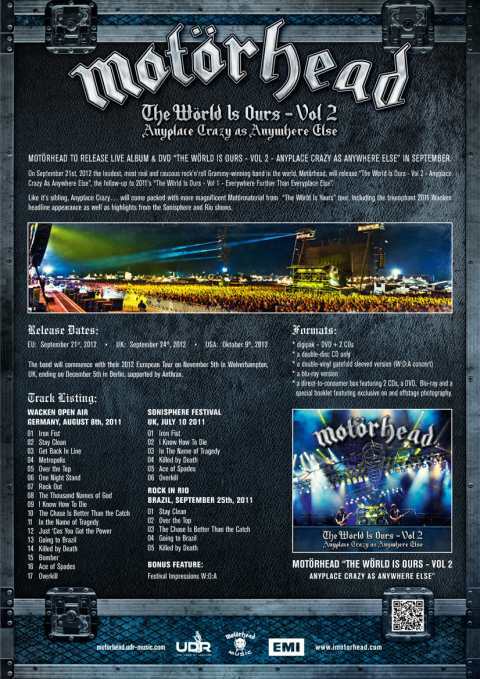 Motörhead will release "The Wörld Is Ours - Vol 2: Anyplace Crazy As Anywhere Else" in Germany on September 21, three days later in the rest of Europe and October 9 in North America via UDR/EMI. The follow-up to 2011's "The Wörld Is Ours – Vol 1: Everywhere Further Than Everyplace Else" will feature the band's 2011 Wacken Open Air headline appearance as well as highlights from Sonisphere (United Kingdom) and Rock In Rio(Brazil) shows. "The Wörld Is Ours - Vol 2: Anyplace Crazy As Anywhere Else" will be available as a digipack (DVD plus two CDs), double-CD, double-vinyl (Wacken Open Air show), Blu-ray and direct-to-consumer version featuring 2 CDs, a DVD/Blu-ray and a special booklet.